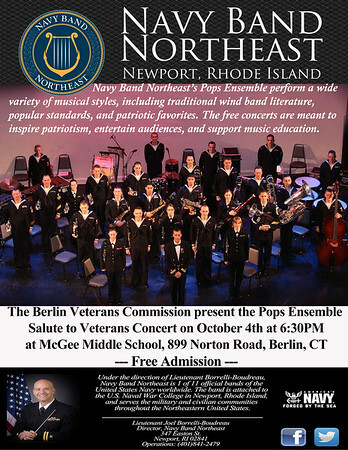 BERLIN - The Berlin Veterans Commission is bringing Navy Band Northeast back to town. The Newport, Rhode Island-based band will play a “Salute to Veterans” concert on Oct. 4 at 6:30 p.m. at McGee Middle School, 899 Norton Road. The concert is free and open to the public. Led by Lt. Joel Borrelli-Boudreau, the band’s Pops Ensemble is known for performing traditional concert band literature and patriotic favorites while enhancing public awareness of the Navy and the importance of naval service. The ensemble comprises personal military decorations include the Navy and Marine Corps Commendation Medal (three awards), Navy and Marine Corps Achievement Medal (two awards), Military Outstanding Volunteer Service Medal, as well as numerous other unit and personal awards. Established in 1974, Navy Band Northeast is based on board Naval Station Newport and is one of 11 official U.S. Navy bands worldwide, providing musical support for military ceremonies, recruiting, morale and retention programs, and community relations. The group supports more than 300 engagements annually throughout an 11-state area of responsibility, performing regularly for high-ranking military and civilian dignitaries, Navy recruiting, public outreach and awareness efforts, and partnership in education programs throughout the Northeast United States. The primary components of Navy Band Northeast are: Pops Ensemble, Marching and Ceremonial Bands, Popular Music Group, Brass Quintet, Woodwind Quintet, and Woodwind Trio. All ensembles perform a wide range of music from patriotic, classical, contemporary, big band swing, country, and the latest top-40 hits. Posted in New Britain Herald, , Berlin on Sunday, 30 September 2018 21:24. Updated: Sunday, 30 September 2018 21:27.